Just about any way you slice it, Republican Donald Trump and Democrat Hillary Clinton would add to the U.S. debt if either of their tax and spending programs were enacted by Congress next year. The Committee for a Responsible Federal Budget, the non-partisan fiscal watchdog group that has been taking the lead in tallying up the costs of the presidential candidates’ proposals, has previously estimated that $14 trillion in publicly held debt would rise to $23.9 trillion by 2026 under Clinton’s plans for raising taxes and boosting domestic spending, while soaring to $35.2 trillion under Trump’s proposals for record tax cuts for wealthy Americans and increased defense spending. Publicly held debt reflects the amount of money the Treasury routinely borrows to cover shortfalls in revenue to keep the government operating until more tax revenues roll in. Many economists and budget experts consider the publicly held debt as the best yardstick for measuring the rise in red ink associated with new spending and tax policies. More broadly, there’s also the gross national debt – the monumental, all-inclusive reckoning of the government’s borrowing from outsiders and internal borrowing between government agencies and accounts that typically gets more attention from politicians, the news media and irate taxpayers. That more commonly cited debt figure – currently $19 trillion and rising – includes not only what the Treasury owes its creditors and lenders but also what it owes itself through transactions involving various trust funds including Social Security and Medicare. Yet under Trump’s tax cut and spending plan, gross debt would rise to $39.5 trillion by 2026, or an astounding doubling of the current $19 trillion figure, according to a new study by the CRFB. By contrast, Clinton’s plans would raise the gross debt to $29.6 trillion during that same period – a roughly 50 percent hike. The reasons that the Trump and Clinton plans have different effects on the two types of debt are fairly technical and obscure. 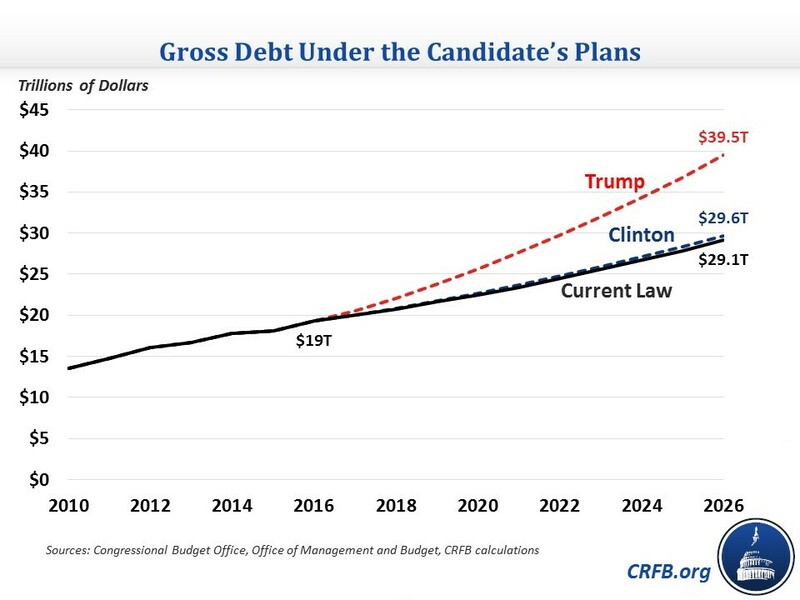 But as it turns out, Clinton’s plan fares a little worse than Trump’s when measured against the gross national debt than the publicly held debt. Viewed another way, on a strictly percentage increase basis, her proposals get pricier than Trump’s when measured against the gross national debt instead of the publicly held debt. One important reason for that is her proposals for immigration reform, according to Marc Goldwein, senior vice president and policy director with CRFB. Immigration reform can have many fiscal effects, he said, including an increase of several hundred billion dollars in long-term payroll tax revenue from immigrants who are able to find jobs. And the money that doesn’t have to be spent out of the trust fund is automatically invested in Treasury notes, and those transactions have the effect of raising the gross debt even more because the government essentially is borrowing from itself. The gross national debt as a share of the overall economy is expected to remain relatively flat over the coming 10 years, with a slight uptick from 104 percent of GDP this year to 105 percent by 2026, according to the study. However, if Clinton’s policies were enacted by Congress, the gross debt would rise to 107 percent of GDP by 2026. Under Trump’s plan, by comparison, it would rise to 143 percent of GDP. In fairness, Clinton’s contribution to a soaring debt could turn out to be more substantial, depending on how much more she would actually spend on her more recent campaign promises. Those include expanding health care coverage through Medicare and providing free tuition at public colleges and universities to low and middle-income students.